By purchasing an entire dining room set you'll never have to worry about your chairs matching the table. This set is very stylish and is sure to be the first thing that your guests notice when they come into your home. It has a contemporary appearance that catches the eye and is sure to gain you compliments. The chairs have a solid flat back that leans back at a slight incline. That makes them comfortable to sit in and ensures that your back won't hurt. The table has a thick sturdy design. The legs are wide and long pieces of wood. 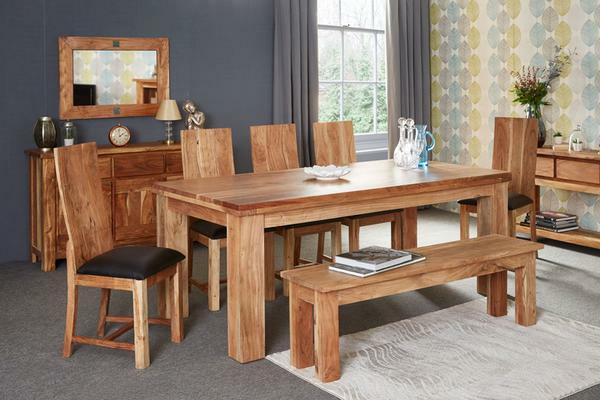 These give the table an attractive craftsman appearance. On top of the table there is plenty of room for an entire meal. You'll never have to worry about running out of room, even when you have the whole family seated here. The brown colour of the wood is highlighted by a rustic teak finish. The acacia wood used in the construction of this piece gives it a unique, natural flair. Table - Length: 200 cm. Width: 100 cm. Height: 78 cm. Chair - Length: 45 cm. Width: 45 cm. Height: 105 cm.